If you’re like me and you love grilled cheese sandwiches so much that you could eat them for every meal, every day, you need a few suggestions on how to grill them up for breakfast. 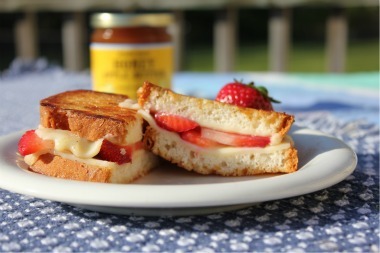 This sandwich is sweet, crunchy and packed with fresh strawberries. Love by kids and adults alike, it will soon be a family favorite. A breakfast sandwich with no eggs? Absolutely! The addition of Honey Apple Butter makes Udi’s Gluten-Free Bread even softer than it already is. Good Morrrnnn-ing, Gluten-Free! Spread 2 tablespoon of Honey-Apple Butter equally on each slice of bread. In a large skillet, heat the butter, plus one tablespoon of the Honey-Apple Butter, over medium heat. Once melted, place a slice of bread Honey-Apple side up in the skillet. Top with a slice of cheese. Next top with the sliced strawberries and the second slice of cheese. Place the second slice of bread Honey-Apple side down on sandwich. Cook for about 6-7 minutes, flipping to ensure each side is golden brown and the cheese is melted, ooey and gooey. Serve immediately and start your day off Udi-fully. This entry was posted on Monday, April 30th, 2012 at 2:22 pm	and is filed under Recipes. You can follow any responses to this entry through the RSS 2.0 feed. You can leave a response, or trackback from your own site.